Inspired by the holiday dedicated to love, love, love. 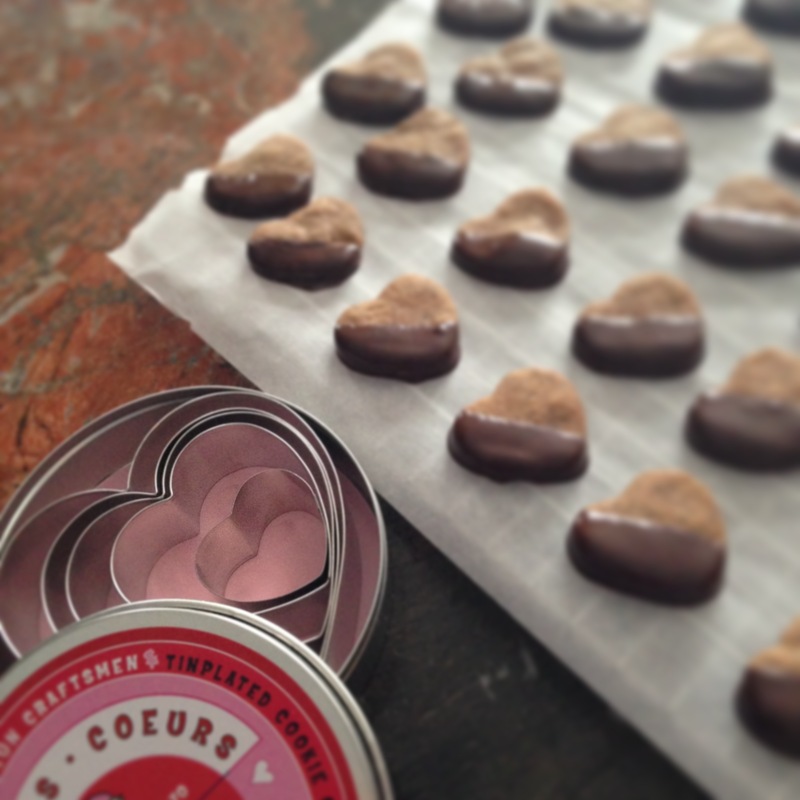 Nothing says Valentine’s Day like hearts and chocolate. So, I made these cookies over the weekend for a party I was going to. These were, I thought, perfectly Valen-tiny. These are quite small but packed with a deliciously satisfying chocolatey-coffee flavor – highly addictive! I find that adding coffee in one form or another to chocolate adds depth and enriches the flavor. In fact, my favorite chocolate cake recipe calls for a cup of black coffee. These cookies are not limited to Valentine’s day though. I hardly need to tell you that you can use another shape but hearts are always in fashion. They would look super cute as an accompaniment to a coffee; set one or two on the coffee dish. If serving a “complimentary-to-coffee” flavored cake like chocolate, moka, vanilla or even a cheesecake, you can stick one in right on top of each piece. Good to know: Because these cookies are to be baked after having been chilled, they can and will probably take more than 30 minutes to bake even though they are so small and thin. So don’t be alarmed, it’s not a mistake. 🙂 It will depend on the thickness of your dough. Just take them out when the tops begin to turn a light golden color. Position oven racks in the upper and lower thirds of the oven and heat the oven to 300ºF. Line two baking sheets with parchment. ( I always find my oven a little weak so I put the temp up to 325. They were not progressing well enough for me at 300) Just monitor them the first time you make them. Combine the butter, sugar, and salt in a stand mixer bowl (use the paddle attachment) or a large mixing bowl. Mix on low-speed until the butter combines with the sugar but isn’t perfectly smooth, 1 to 2 minutes. Add the flour and ground espresso and mix on low-speed, scraping the bowl frequently, until the dough has just about pulled together, about 3 minutes; don’t overmix. On a lightly floured surface, roll the dough to about 1/4 inch thick. Aim for a uniform thickness to ensure even baking. 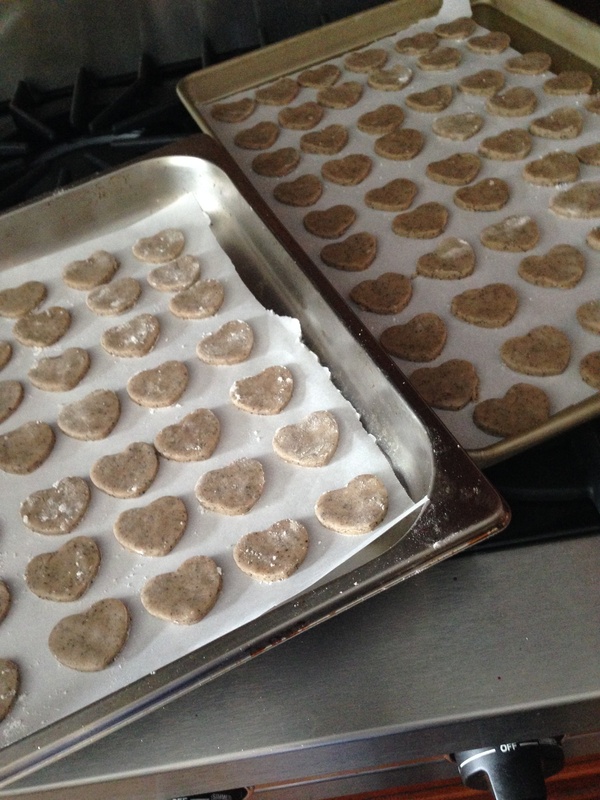 Using a heart or other shape cookie cutter, cut out shapes as close to one another as possible. Press the scraps together, roll them out, and cut out more cookies. If the dough becomes sticky, refrigerate it briefly. Arrange the cookies on two parchment-lined baking sheets and refrigerate until chilled, at least 20 minutes. Note: Even if your dough is not sticky, (mine was on the crumbly side) you will still need to add flour underneath the dough after rolling it out. My dough was delicate so I had to gently lift one side up, add flour, then do the same with the other side. It’s not that much of a big deal but if the dough sticks to your counter, removing the cut-outs with a knife or spatula could be damaging to the shape. Bake the cookies until golden on the bottom and edges and pale to golden on top, 30 minutes to 1 hour. (After 15 minutes, swap the position of the baking sheets and rotate them 180 degrees for even baking.) If the cookies are done before 30 minutes, reduce the oven temperature to 275° F for the remaining batches; if they take longer than 1 hour, increase the temperature to 325° F.
Remove from the oven and allow to cool. Set a sheet of parchment or waxed paper on a work surface. Put the chocolate and shortening in a small heatproof bowl and set the bowl over a pan of simmering water. Melt the chocolate, stirring, until it’s smooth and warm; don’t let it get hot. Dip half of each cookie into the chocolate. Set the cookies on the parchment and let the chocolate set up at room temperature, about 2 hours.